It had been a long day in the saddle. 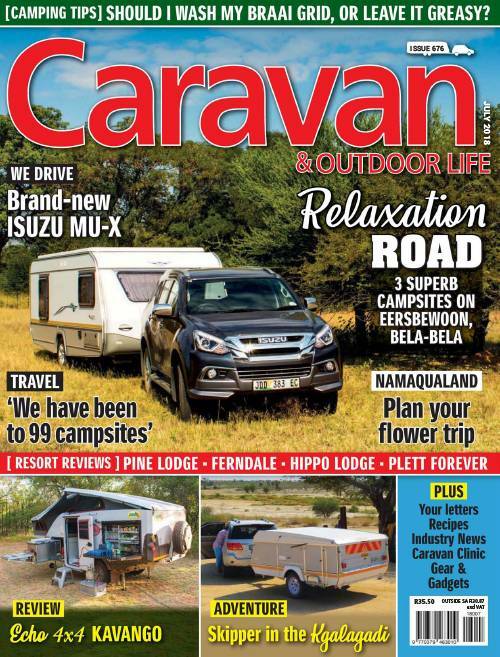 We’d come a circuitous 400 km route from Cambria on the eastern edge of the Baviaanskloof via the Elandspad outside Patensie to Uitenhage, and then through Grahamstown onto Cathcart. Needless to say we were tired and a little grumpy when we got to our destination at dusk. But when you are welcomed by a friendly farm manager like Stuart Pringle, who shows you around your sumptuously green and well organised campsite, your mood improves quickly. After being taken on the tour of the modern ablution blocks and centralised communal lapa with its electricity points, fridges, kettle and toaster, we bade Stuart farewell and set up camp in record time. 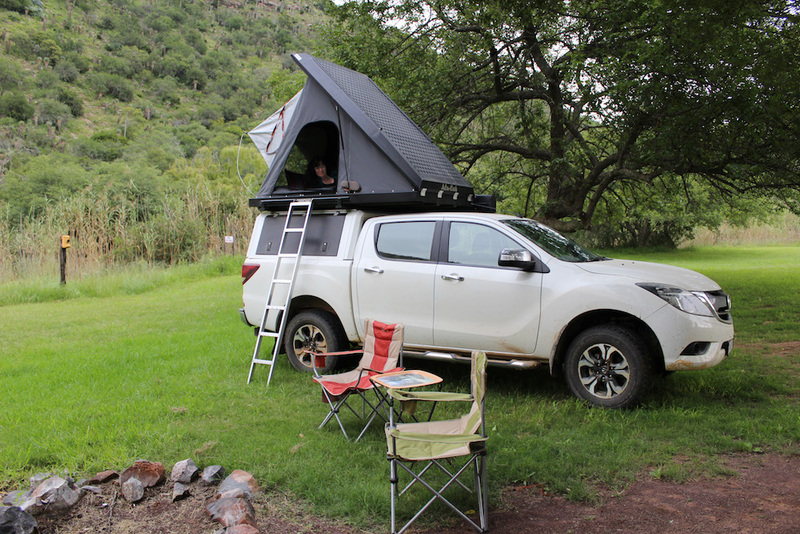 Of course, having the top of the range Alu-Cab hard shell roof tent and 180° fold-out awning means setup is dead easy and we were soon eating an alfresco tin curry dinner and enjoying a reasonable bottle of red. There are three main group campsites that can comfortably accommodate three to four large families each; but the lushly grassed grounds can accommodate many more, as is borne out by the hundreds of mountain bike riders that stay here during the annual charity event. 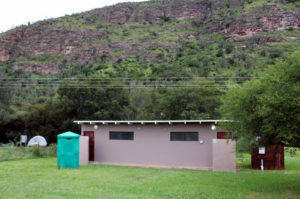 There are two clean and modern ablution blocks for men and women as well as a row of the old outside showers and two porta-loos that used to service the campsite before the new facilities were built. 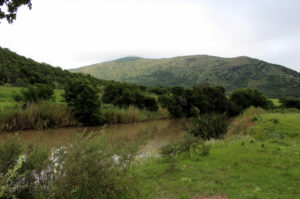 One of the many plusses of this farm campsite, situated in the beautiful Henderson Valley outside Catchcart, is its location next to the rush of the Thomas River which is backed by a large flat-topped mountain studded with Euphorbia Grandidens (they look like multi-stemmed candelabras) and other dense bush. Two floodlights (you can turn them off when you want to sleep) illuminate this awesome spectacle which makes for dreamy viewing against the roar of the water as it cascades over a nearby weir. As the evening wore on and the wine ventilated our weary bodies and minds, we were mesmerised by the star-studded night sky wheeling overhead. Washing-up and/or laundry facilities: Portable basin system for washing up at main lapa. Tariffs: R100 p.p.p.n for camping (day visitors R50 each); R250 p.p.p.n in the chalet. Children under 5 stay free. 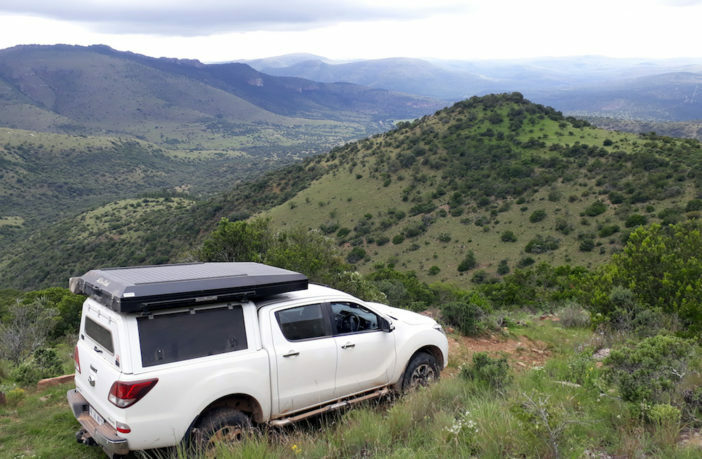 4×4 trails are charged at R200 per vehicle per day. The next morning in the light of dawn, I was wandering about in my slops while I waited for the kettle to boil in the lapa and wondered whether we would have time to row a canoe down the river later that afternoon. But we had a full day of 4×4-ing planned on one of Ferndale’s six challenging routes, so the jury was still out on that thought; as well as being able throw in a line in for a nibble from a yellowfish or two. 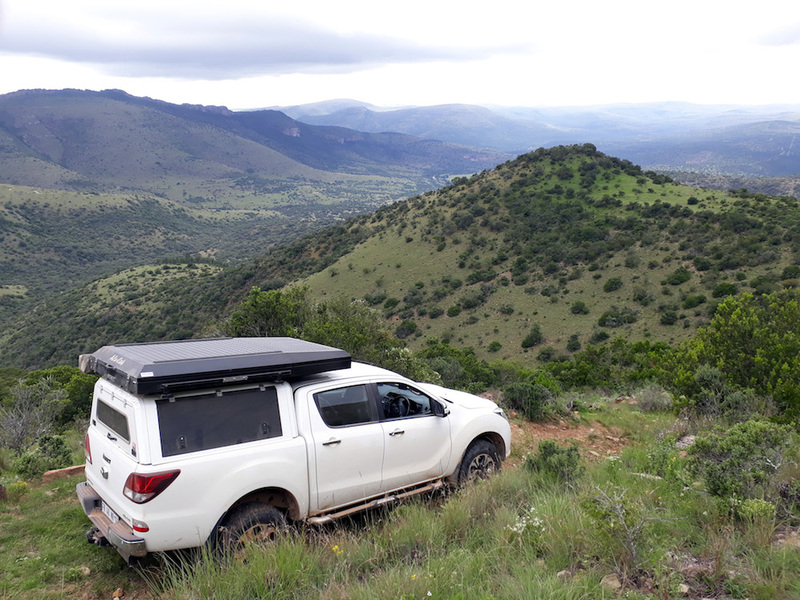 We chose the Circular Route on the Ferndale 4×4 track (there’s another circle route on the owner’s adjacent Red Cone Farm) and bumped and ground our way alongside the Thomas River for a while and then rose through the many side kloofs of the Henderson Valley. Having got lost a couple of times along the way, we arrived back at the campsite after four and a half long hours and decided to give all other activities that afternoon a miss; opting to read and snooze instead. Farm owner Butch James also came around to say hi and share a cup of coffee with us. We braaied in one of the three illuminated braais allocated to our group campsite and were spoilt by the amount of good acacia wood provided. 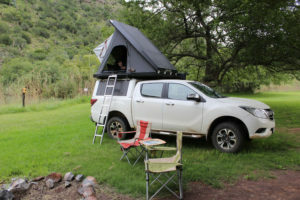 If I hadn’t settled the bakkie and our roof-tent at the perfect angle already, we would have conjured up the bonfire we’d been encouraged to make in the nearby fire pit; but I reckoned our rig was too close for comfort. Butch took us on a tour of the well-equipped self-catering chalet the next morning before we hit the road. With its large wooden deck overlooking the Thomas River and its upstairs pub with adjacent balcony, it would certainly provide a luxury break from camping; an option we might well enjoy next time. To contact the campsite or to make a booking, fill out the form below.